Dear Readers, my Dad has always grown roses. They seemed to love the heavy clay soil of London, and all that was needed was some pruning and a bucket of horse manure, and off they went. It has been a little more difficult in the light soil of Dorset, but there are fifteen varieties in flower around Mum and Dad’s bungalow. 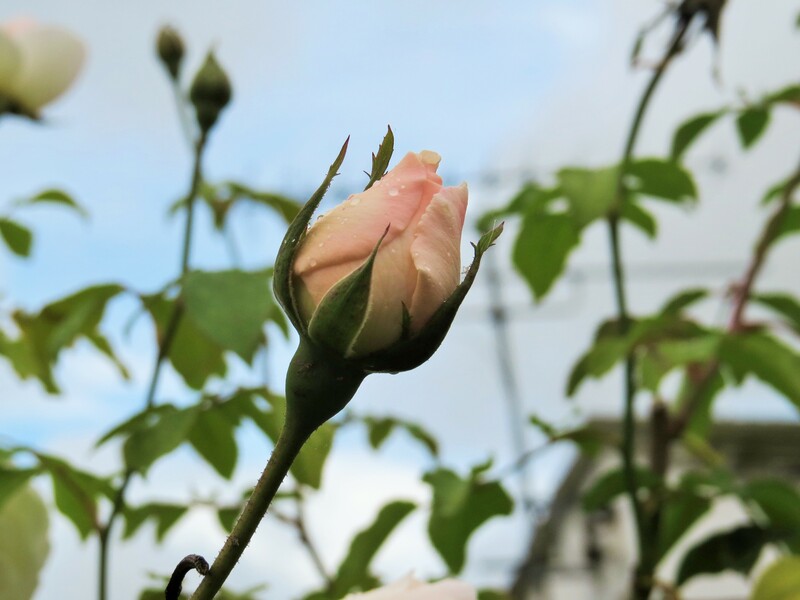 There is the heavy-headed ivory-pink rose that Mum could see from the kitchen window, when she was able to stand long enough to do the washing up. 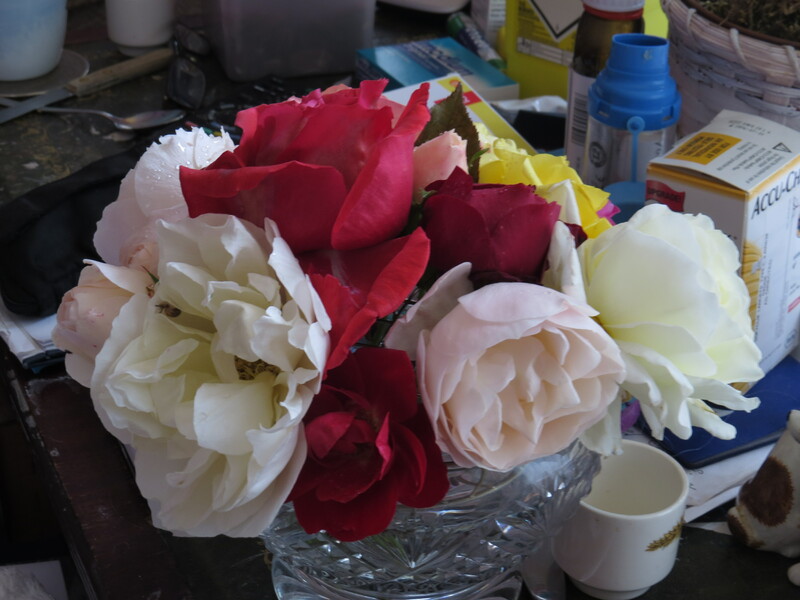 There are the standard roses, one cerise, one velvet-red, that Dad’s sisters bought for their diamond wedding anniversary. 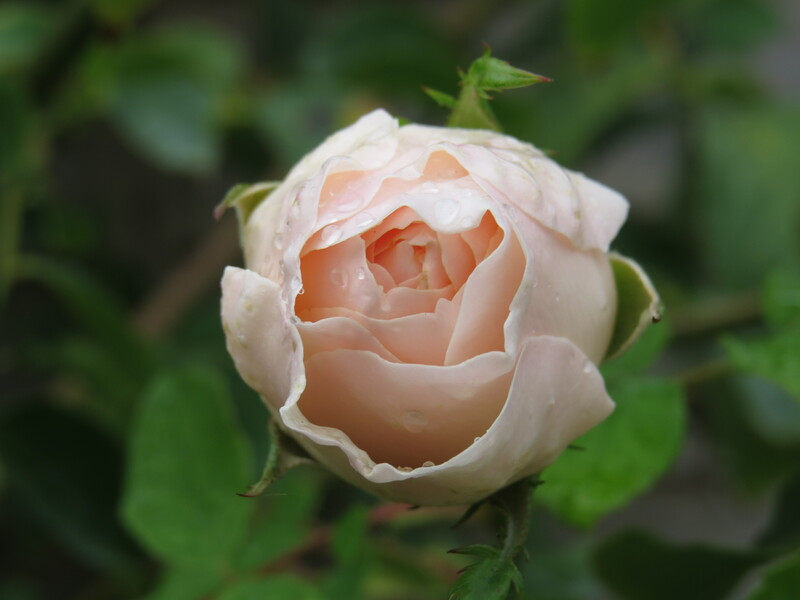 There are blue-grey roses and yellow roses, and an apricot one that doesn’t have many flowers, but makes up for it in the perfection of those petals. 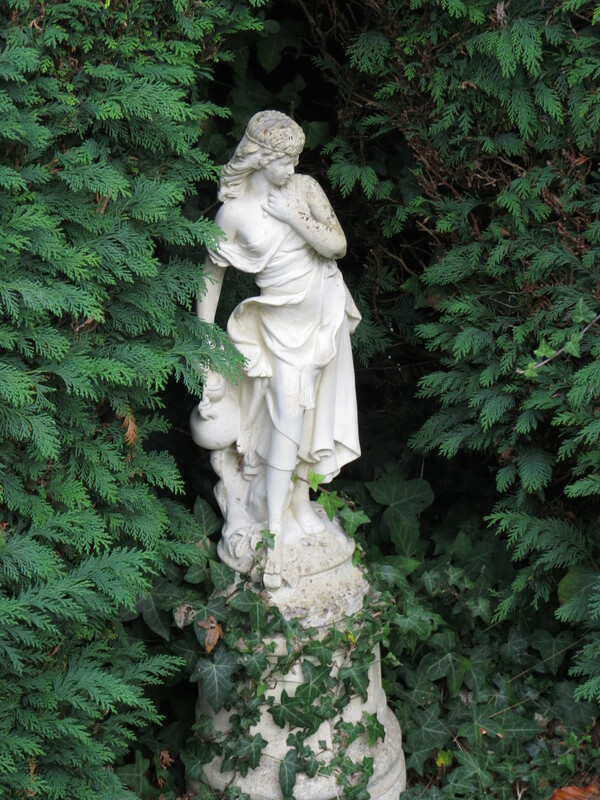 Hidden in the garden are fairies and fawns and meerkats, all peeking up through the undergrowth. There is a model of St Francis of Assisi who often has a live robin perched on his head. The twelve-foot high beech hedge is a-twitter with sparrows, and a blackbird nests there. 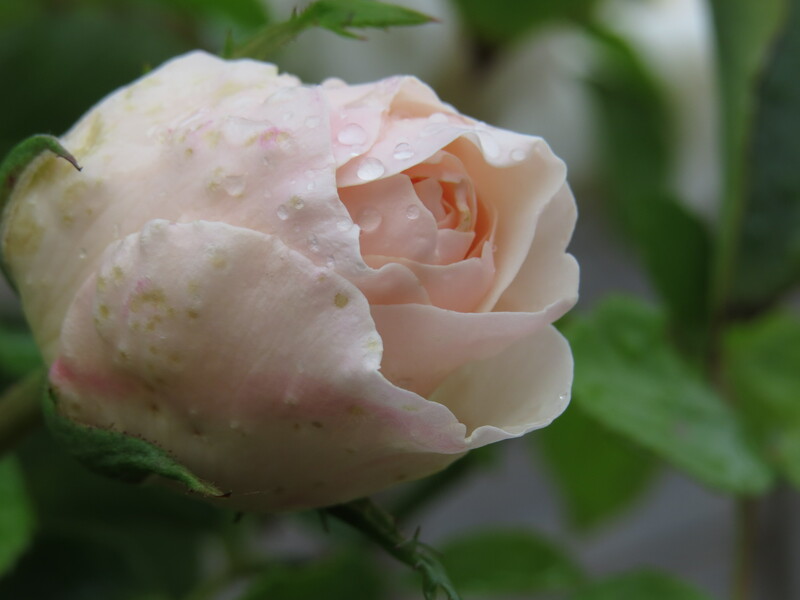 This week I went gathering roses in the rain. 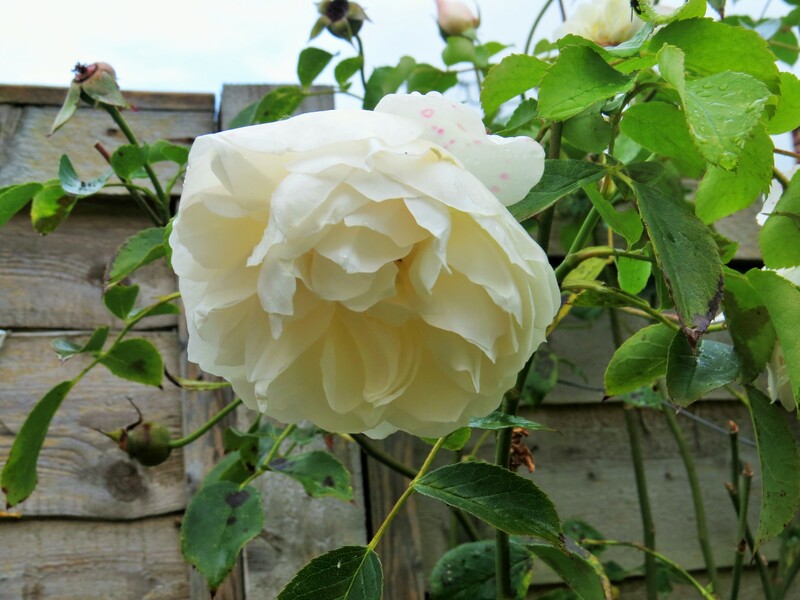 I found some blooms on the ivory rose that weren’t yet speckled pink from the rain. The red rose was bowed down, the edges of some of the petals dry and crinkled like the pages of an old book. A yellow rose disintegrated as soon as I touched it. 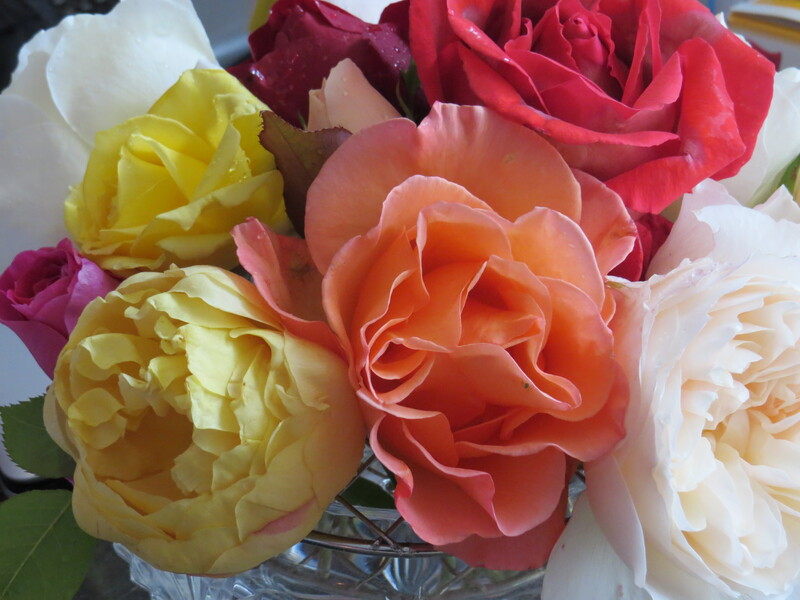 I cut the loveliest blooms in the garden, arranged them in a rose bowl and took them into the living room. I put them on the table next to Mum’s reclining chair. ‘Pretty’, she said, ‘But they smell too much, can you put them over there? Mum has been smelling things that aren’t there – fish, burning, faeces. It’s strange how she never imagines honeysuckle or jasmine or freesia. And normal everyday smells, like a bunch of roses or a roasting chicken, are overwhelming to her. She came out of hospital, after seven weeks, a shadow of the woman who went in, and with a worsened pressure sore, a lot of physical weakness and much increased confusion. Hospital has had a bad effect on both Mum and Dad – after a two week stay, Dad’s dementia symptoms skyrocketed. So much has been going on, but the general trend is downwards. Take last night, for example. Dad had a doctor’s appointment on Friday, and he was anxious about it, so he popped into my bedroom at 11 o’clock, 1 o’clock, 3 o’clock and 4 o’clock to ask me if it was time to go yet. Then at four o’clock Mum woke up and was extremely agitated. She wants to get out of bed, then she wants to get back in. She no longer remembers the layout of the house. She no longer remembers how to operate her reclining chair. Sometimes, she doesn’t quite remember where parts of her body were. I managed to hurt my back moving her over in the bed, and when she was solicitous of my pain I had to walk outside for a quick weep and to pull myself back together. And this morning, dad’s chest is bad (he has COPD) and so he didn’t get to the doctor anyway. As I write this, he is back on the antibiotics and the steroids, and we’re praying that he doesn’t end up back in hospital. And it is to counteract scenarios like this that I finally talked to the doctor, who advised that finding a nursing home for Mum and Dad was now the best option. In a nursing home they could keep Mum and Dad together, and endeavour to reduce the amount and duration of hospital visits that they required. Plus, they would be looked after properly, 24 hours a day. I was sceptical at first. I visited one nursing home that had an artificial beach and a dedicated cinema room, and still didn’t feel that it was right for Mum and Dad. I ruled out many on the grounds of their CQC reports. It’s hard to find a home that will look after both people with dementia and who are physically frail, (though this could be a red herring since Mum has been less coherent since she came out of hospital). And then I visited a home in the centre of Dorchester, and as soon as I walked through the door I got the feeling that this was an open, friendly, person-centred place. I talked to the manager, and we clicked straight away. And, unusually, she had two rooms available. Do you sometimes get a feeling that something is fate? The reason that I was going to this home was because Mum and Dad’s GP had had a relative stay there until she died, and he had visited it frequently. It soon seemed that everyone had a good word to say for it – one of our lovely carers had worked there, the taxi driver’s partner still worked there, the district nurse had worked there. All of them reported back to Mum and Dad that it was a good place. Dad went from ‘I don’t want to try that’ to ‘I don’t want to sell the bungalow for less than £300k’ in 24 hours. I’m not sure that Mum really understands what’s going on a lot of the time. But I honestly think that this is the best chance they have for a fourth act in their lives, a chance to have a wider circle of people to talk to and things to do. They have both agreed to give the home a go, and so we have an assessment happening next Tuesday. I hope and pray that it goes well, and that Mum and Dad are prepared to try it, because we are running out of choices. Certainly I can’t go on the way I am at the moment. I had terrible chest pains that turned out to be nothing when investigated, but which scared me at the time. I am exhausted, and stressed, and not, I fear, the good and patient nursemaid that I was when all this started several years ago. Not enough is written about how caring for people long-term changes the whole nature of the relationship. To me, for much of the time, Mum and Dad are not primarily my parents, but have become patients, a project to be managed. I don’t have time to sit down and actually talk to them because I’m sorting out medications, doctors’ visits, transport to the hospital, the online grocery order, the army of carers and agencies. I would like to be able to spend some real time with Mum and Dad, to listen to them, to hear their stories while there is still time. I want to know them as people again, and I have gradually lost that in the slowly rising flood of other responsibilities. I am travelling down again next week for the assessment meeting on Tuesday and if all goes well, Mum and Dad could possibly be ensconced by the end of the week. It’s all happening so quickly that I’m struggling to keep up but if something feels right, it seems appropriate to go with the flow. We won’t do anything hasty with the bungalow until we’re absolutely sure that Mum and Dad are happy (in spite of Dad’s encouragement to do otherwise). I recognise that it will be a big transition for Mum and Dad, and that there will be bumps along the way, but it feels like the right thing to do. And I also have to deal with my own grief that things are changing. A way of life could be coming to an end for me, too. As I cut the roses and bury my face in those soft, fragrant petals, I realise that this might be the last time that I am able to fill a bowl with them. Mum and Dad have loved this bungalow, and especially the garden, and so have I. But if things work out, this garden will soon be someone else’s delight, and that’s as it should be. And I will have to let go of my role as primary carer and organiser, and to let someone else manage all that, and that will be hard too. But everything changes, in nature and in our lives, and so much suffering is caused by grimly hanging on when we could be letting go. There will be much sorrow during the next few weeks, I’m sure, but in my heart I feel the tentative growth of hope. This entry was posted in Bugwoman on Location on October 13, 2018 by Bug Woman. I want to give you a big, big hug. I do so hope that the assessment goes well and that it is the start of a new, happier chapter in your parents’ lives – and in yours too. I hated the effects of caring firstly for my mum and then for my aunt. My relationships with each became very task-focussed through the constraints of time and effort. The time caring for my mum was, thankfully, quite short before she died from cancer. I then cared for my aunt through her dementia. For several years, she stubbornly resisted having a ‘proper’ carer or going into a home. Eventually, two years ago and following a couple of falls, she went to live in a care home close to me – and it was the best thing! She settled quickly, mainly because she was allowed to be herself and the staff made such a fuss of her. I was able to relax for the first time in years, knowing that she was safe and well looked after. Our relationship then shifted back to one which we could enjoy. I saw her regularly and yes, at times she was querulous and demanding, but I could withstand that because when I left her, I knew she would forget the cross words and be warm and safe and content. It’s so hard and you will grieve enormously, you will still worry and find it hard to let go of *caring* but over time, the part of caring that is love will become predominant. 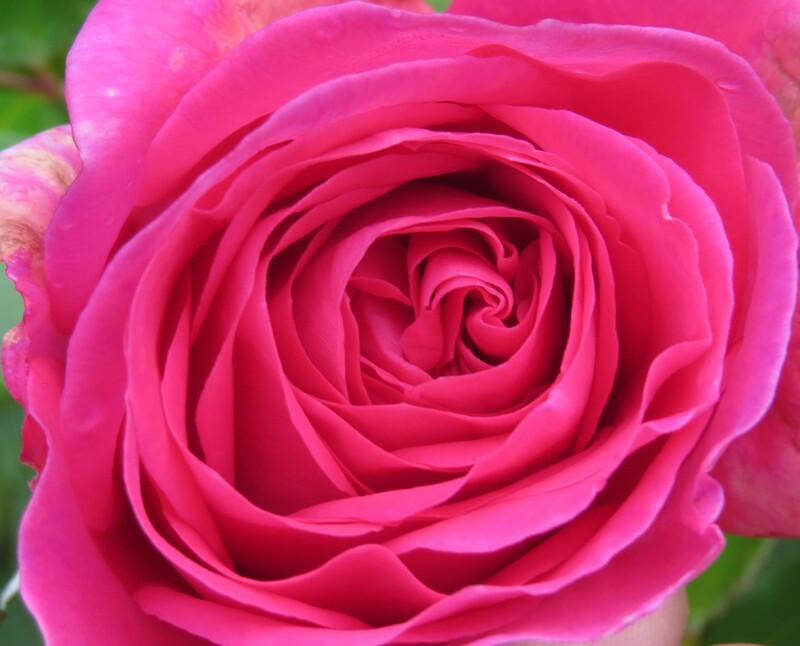 Beautiful roses. I do so hope your parents are able to move together to the place you describe. This week here I read of a study that showed all elderly people even those with severe dementia, respond better to being spoken to in a straightforward and respectful way No baby talk or use of’we’ This can happen in hospital, even when staff are trying to be kind. Wise words from Gail. Slightly different problems may appear once they are installed in the nursing home but any ‘heavy lifting’ (metaphor) won’t be your job and some of that stress and dread will lessen. This does sound as if a long term solution is now at hand – I’m so happy for you. I too have spent much of the last few days visiting care homes and you are right, sometimes you walk into one and just know it’s right. Sadly the one we felt that about has a long waiting list. None of the rest I would contemplate sending my mum to live in. You will get your relationship back with your parents as they will no longer be your patients but people to spend some quality time with. A great shame about the house though. I felt the same when the bungalow my dad built practically single-handed had to be sold to pay for my mum’s retirement flat. Now it looks as if that will have to be sold for a short amount of residential care. At least you will have these lovely pictures, as I do of my dad’s beautiful garden. Really never wanted to see their house leave the family but situations change and you have to just react to them. All the best. Good luck Vivienne, the signs do seem to be positive for the home so I hope it all works out well. Oh Viv. My heart aches for you and all of this – I feel as though I understand somehow what you are feeling although I’ve never actually had anything like this happen to me. Maybe I can just imagine it all through your incredibly amazing writing. I worked in a home part time as a care assistant when I was university and it was the most incredible rewarding job I’ve ever done. Good homes exist and the people that work there really care and go over and above the call of duty to look after their patients. I know because I saw it. So don’t be afraid and I really hope it will all work out because it will give you part of your life back – and your sanity. I wish you strength Vivienne, to see this through and to get your parents settled and able to properly relate to them again. Oh, my goodness I do feel for you. I am praying and hoping the assessment goes well and your mum and dad can continue to be together and looked after. It will be a new phase for all of you but a necessary one. Wow, Veronica….yes stress does affect us all in different ways, doesn’t it. I think we sometimes don’t realise how badly we’re affected until the situation changes and we can let ourselves feel our anguish. Dear Vivienne, you do us all great honor by baring your soul and sharing your experiences and innermost thoughts. My heart aches for you. It is precisely because you are so loving and thoughtful and kind that you suffer so. I wish we could help take the pain away. And even in the midst of your words of difficulties, you show images of exquisite beauty. You are a wonder, and your parents are so fortunate to have you as a daughter, my friend.